Boone Hall seen through its massive iron gate. CHARLESTON, S.C. – Boone Hall Plantation has a Canadian connection. While the plantation was founded in 1681, the building we toured (as we did two years ago) is the fourth on that spot. The first two burned. The third fell into disrepair. What now stands was built by Canadian Ambassador Thomas Stone in 1935. Rather than a simple farmhouse, he built a mansion, displaying his wealth in the cantilevered staircase in the foyer, the 11-foot mirror in the dining room and by building a hydroelectric plant to run electricity into his home. So unheard-of was this, Paramount sent a camera crew out to film it. Stone was only able to enjoy his mansion for four years; he was called home at the beginning of the Second World War. 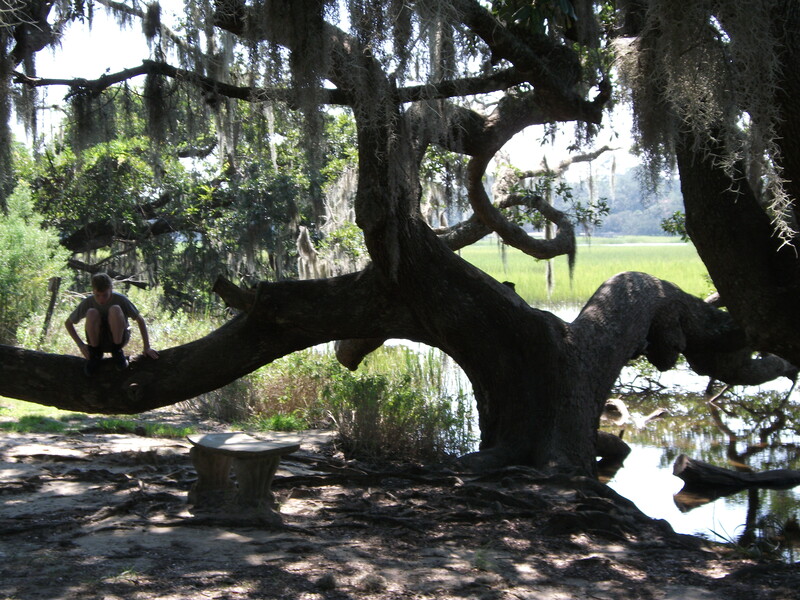 The live oaks at Boone Hall and around Charleston are up to 600 years old.